As giant icebergs bob across the open seas they leave behind a trail of nutrient-rich meltwater, sparking new life in the world’s remotest and least hospitable oceans. This in turn means more carbon is taken from the atmosphere and stored below the waves. Massive icebergs may be a symptom of climate change – but they can also help keep it in check. “Giant” icebergs are technically those at least 18km in length. At any one time several dozen are afloat in the Southern Ocean, and individually they can survive for up to a decade. They make up roughly half of the ice discharged from Antarctica, so around 1000km3 per year – equivalent to the annual flow of the Congo River. However these icebergs come in fits and starts. Some years hardly any break off, whereas five of the biggest icebergs recorded in the satellite era broke off into the Southern Ocean during 1999-2003. So a big iceberg year can have a huge impact. In fact, during previous ice ages huge “iceberg armadas” from Northern Hemisphere ice sheets are believed to have redirected the Gulf Stream – albeit thanks to melting on a slightly larger scale. It’s clear then that meltwater from giant icebergs can directly impact circulation of the Southern Ocean, and the climate above it. However, in a recent paper in Nature Geoscience, colleagues at the University of Sheffield and I have shown there is also a significant impact on the carbon sink, and hence the rate of exchange of CO2 between the ocean and atmosphere. Here’s how it works: as Antarctic ice sheets slowly slide towards the ocean they bump along the continent’s bedrock, picking up iron and other nutrients which become imprisoned within the ice. When icebergs melt they release these chemicals into the sea. As icebergs are essentially freshwater, their water is buoyant and ascends to the ocean surface, where the iron and nutrients are utilised by phytoplankton – tiny plant-like organisms at the bottom of the marine food web. This makes a big difference in the Southern Ocean, where limited dissolved iron – important for cell growth – restricts productivity despite an abundance of nitrate. 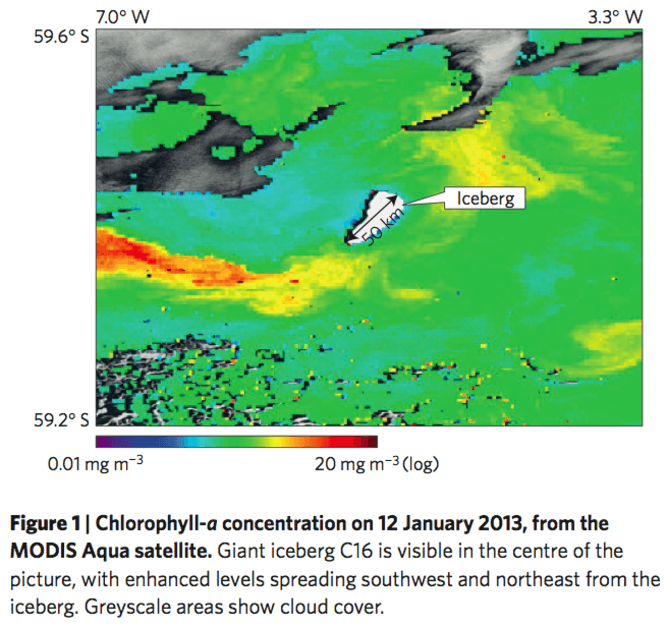 Melting icebergs release iron in a bio-available form, so encourage phytoplankton growth, photosynthesis, and the draw-down of atmospheric CO2. shows life blossoming for hundreds of kilometres around this giant iceberg. Giant icebergs are especially important as we found the increase in productivity from their meltwater could be as much as a factor of ten above background levels, and extend hundreds of kilometres away from the melting iceberg, both upstream and downstream. 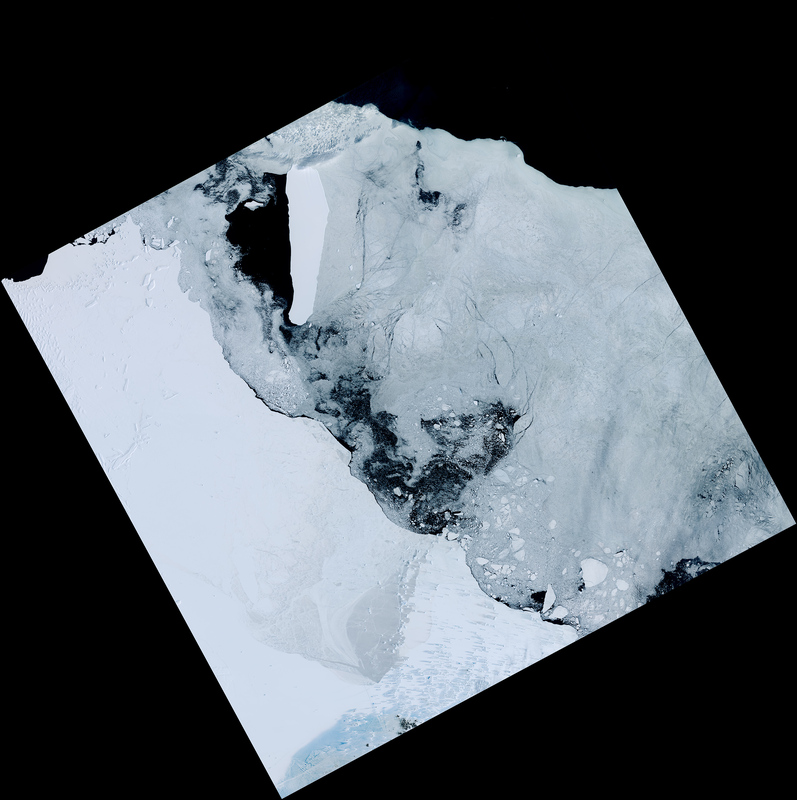 At fixed points, the effect could last for up to a month after passage of an iceberg. This is a far larger impact on the surrounding ocean than the limited previous observational studies had found, and could provide as much as 10-20% of the net carbon export into the deep waters of the Southern Ocean. We’ve only accurately tracked giant icebergs since the 1980s so it’s difficult to know exactly what the future holds. However, the increasing amounts of ice discharged from Antarctica in recent decades, combined with likely acceleration of change under global warming, suggests we’ll see more giant icebergs in future. If this were so, the enhanced productivity of the Southern Ocean, taking more CO2 from the atmosphere, will act as a small check on global warming. Icebergs are abundant in parts of the northern oceans, as the Titanic tragedy showed. However, those calved from Greenland are only very rarely more than a kilometre or so long, and are almost never “giants". The North Atlantic also has plenty of iron, mostly thanks to Saharan dust carried there in the atmosphere. The Arctic and North Atlantic are therefore missing key ingredients for a strong biological response to iceberg meltwater. However, large amounts of freshwater entering the North Atlantic could affect the meridional overturning circulation, a current which sends the Gulf Stream northwards along the surface while cooler, deeper water moves southwards. More icebergs from Greenland, or further ice melting due to global warming, may help slow this current and check climate change. Fortunately, the Northern Hemisphere no longer has the large ice sheets with a history of instability that could cause this sort of “Day After Tomorrow” scenario. So if any giant icebergs are going to help slow climate change they will likely come from Antarctica, one of global warming’s most symbolic places.